Meatloaf is a quintessentially American dish. 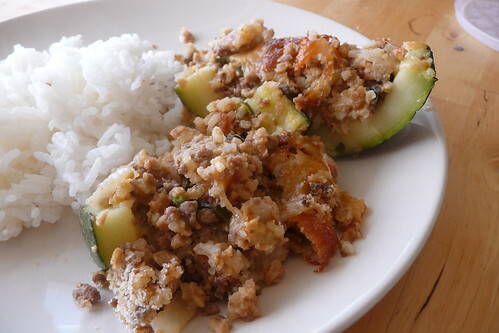 It’s meaty, unpretentious and satisfying. It’s also good the next day for sandwiches. A few weeks ago, when I made this, the weather was more “tail-end of winter” than “almost-summer”, with consistent overnight freezing temperatures, rain and snow in the afternoon and generally miserable. Don’t these look delicious? This is one of the breakfasts my husband makes for me on a regular basis! 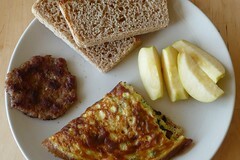 An omelet, two slices of English Muffin Bread and a homemade sausage patty! On Monday, I’ll share the English Muffin Bread recipe. This is one my husband makes and it is so good, I don’t know why we didn’t do it sooner. The impetus for it was reading the sausage section in Ruhlman’s book, Ratio. So, we picked up a bone-in pork roast on sale with a fair amount of fat and tried again. Yes, Ruhlman is right. 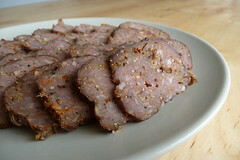 20% fat is about right, it creates a yummy sausage with good texture, juicy flavor and just enough fat to fry itself up. I would caution you against skipping or reducing the minimum hour of marinating; it’s absolutely essential (thanks Alton!) and produces the best flavor. Now, I’ll be the first to tell you that this is NOT an authentic pepperoni sausage. Real pepperoni is raw, not cooked; it’s fermented, cured and dried over the course of weeks. I do not have the facilities to do this nor the desire. I just want something that’s easy, spicy and tastes reasonably like pepperoni.